Looking at this photo of artist Elizabeth Tashjian in our new set of portraits of women artists at the Smithsonian Commons on Flickr, it seemed obvious to me that I was looking at a professionally-trained artist, who in fact, won prizes for her artwork while at the National Academy of Art in New York City during the 1930s. So, I was intrigued that the caption included with the photo by the American Art Museum and its Renwick Gallery, called Tashjian "The Nut Lady," and decided to learn more about this curious nickname. 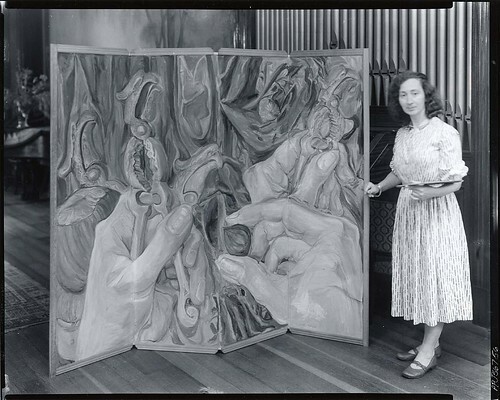 As evidenced by this photograph of Tashjian standing next to a large paneled painting of hands holding a nut and a nutcracker, the artist considered the nut to be very beautiful and constantly used it as subject in her artwork. In 1972, she opened a nut museum in Old Lyme, Connecticut to display her work and champion the nut. By the early 1980s Ms. Tashjian became a minor celebrity, demonstrating her passion for nuts and her quirky sense of humor in appearances on The Johnny Carson Show and other TV and radio talk shows, and garnering the support of a Roadside America fan club website that features some of her nut-themed anthems. However, the kitsch appeal of The Nut Museum and the somewhat eccentric approach that Ms. Tashjian took to her subject matter meant that the public was often disinterested in her artwork, focusing more on the unconventional nature of the artist herself.